Rancho Cucamonga, CA - The Lancaster JetHawks and Rancho Cucamonga Quakes exchanged late leads on Saturday night, but at the end of the night, Lancaster kept Rancho winless at home on the young season, as the JetHawks used a two-run ninth to drop the Quakes by a final of 7-6 on Saturday night. Starling Heredia, with just one hit in his first 18 at-bats, smashed a ball over the left-field fence with a man aboard, giving Rancho Cucamonga a 6-5 lead in the last of the eighth in front of a sold-out crowd of more than 4,700 fans. Quakes' reliever Yeison Cespedes (0-1) couldn't hold the lead though, as the JetHawks capitalized on four walks in the ninth and took a 7-6 lead. Rancho went in order in the last of the ninth, as JetHawks' closer Tommy Doyle earned his second save of the year. 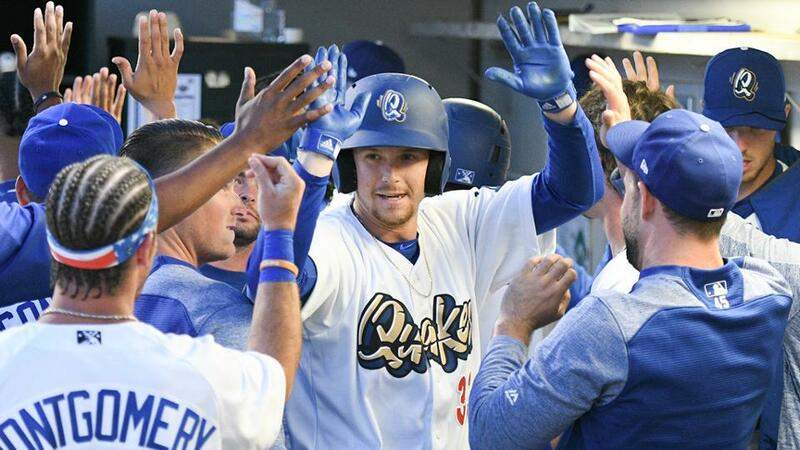 Devin Mann was one of three Quakes to record a multi-hit game, as he finished with two hits and three RBIs, thanks to a three-run blast that put the Quakes in front 3-0 after just one inning. That lead was short-lived though, as starter Michael Grove allowed three in the second and was chased after retiring two batters in the second inning. The Quakes (5-5) will try to avoid the sweep on Sunday afternoon at 2:05pm. Rancho Cucamonga has not yet named a starting pitcher, while Lancaster will go with Matt Dennis (0-1). Sunday is a U.S. Bank Youth Baseball Clinic, as kids can receive free baseball instruction from Quakes players and coaches with the purchase of a ticket to the game. The clinic begins at 10am and registration is at 9:00am. Tickets are available by calling (909) 481-5000 or online at rcquakes.com. We hope to see you at LoanMart Field…Go Quakes!